Will a seven day a week NHS emerge from the Eltham Community Hospital? 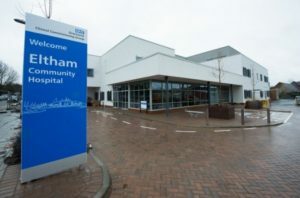 At the recent meeting of the Eltham Town Centre Partnership (ETCP) held on 19th April, there was a substantial update provided on progress in bringing the Eltham Community Hospital into full use. After a period where its usage appears to have been inefficient (to say the least) I am pleased to say that the briefing provided real hope that services there would improve, providing a better quality, all week service for local residents and releasing pressure on the Queen Elizabeth Hospital. I’m not sure that this makes a good blog, but I thought I would just take you through the presentation given at the meeting from the notes I took. A ground floor with 2 GP surgeries, some space for outpatients and an operating theatre with recovery suite, x-ray and ultrasound. The outpatients area is mostly used by the Oxleas NHS Foundation Trust, although there was a suggestion that it could be used more efficiently. The operating theatre, x-ray and ultrasound have never been used. First floor, two inpatient ward of 20 beds each. One ward is used, but the other closed around a year ago mostly as a cost cutting measure from the local NHS CCG. A top floor which is office space. The person briefing the ETCP was a new appointee but had managed similar situations elsewhere previously. In my opinion, this was reflected in the confident way she dealt with the issues and outlined her plans for the way forward. One of the interesting statements made was that this experienced NHS employee had never come across a Community Hospital with an operating theatre in it as it simply wasn’t an efficient way of using the very expensive staff who do operations. In essence we were told they would spend too much time sitting around because they could not move quickly from one operation to another. The solution to this we were informed was to change the way the operating theatre would be used from procedures involving a general anaesthetic to ones with only a local anaesthetic and as a result physiotherapy and podiatry services would start to use the space. In addition, there were plans being developed so that the local NHS Trust would start to use the x-ray and ultrasound services from 1st July this year (although this did depend on some planning issues being sorted out with the Council). Ideally the x-ray and ultrasound services will work six days a week from this summer with an aspiration to increase this to seven days in the long term. In December, GP services started to run from the Community Hospital all day on Saturday and Sunday morning so every single practice across Borough can refer their patients to this hub. The services are very busy on Saturday but quite quiet on Sunday. The new plan is from late April to open until 8pm in the evening on weekdays (4.30pm to 8pm) so this will be an extra layer of services beyond the practices (which tend to close at 6.30pm). How this new system works will be reviewed and then the Community Hospital will consider longer opening hours at the weekend on both Saturday and Sunday. The general aim is to use this service to reduce the numbers going to the QE – Urgent Care Centre where usage normally spikes at 4.30pm in the afternoon (after school). From my point of view this sounds exactly like the Grabadoc Service, but I guess they were always going to have to reinvent that after the Council allowed it to close and the local MP failed to stand up for it. These extra opening hours sound a really useful service but when I asked, it was quite clear that not all GPs are using it – you have to ask your GP to refer you to the surgeries at the Community Hospital(not turn up as an emergency), but there are appointments there over the weekend which sounds an excellent development. It was quite clear that there was a real shortage of beds in Greenwich over the winter, but 20 remained closed in Eltham while the NHS paid for a private company to open and run a ward in Sidcup at Queen Mary’s Hospital. This is clearly inefficient and the plan is to get the second ward open by September or October at the latest. The core point of the plan is to avoid the Community Hospital Ward becoming a long-term convalescence home for older patients (which is not a good way of caring for people apparently) and as a result there are still questions about whether this should be a ‘step-up’ or ‘step-down’ ward (not sure what this means entirely but open to clarifications). Ideally the NHS would open these beds, but it may take a private sector provider to do this as NHS locally is struggling currently. Ideally, by next winter both wards should be open and working properly. I think this covers the main points which were discussed and it is certainly great to hear that there are plans for the Eltham Community Hospital to become a full part of the community. The overall aim is for the Hospital to attract an extra 37,000 patients, although it was acknowledged that the parking in Eltham might struggle to cope with this level of increased visitors – something which I know many people (including me) have pointed out as a potential problem over the years.